So dürfte sie jetzt zu Uschis Einrichtung passen, hoffe ich, lol. Lovely card Beate!! Beautiful silhouette,and die! Thanks for joining us on Crafty Sentiments Designs. Great card. Thanks for joining us for Vickie's Challenge at Lady Anne's. 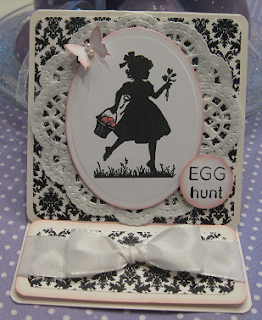 gorgeous card, I love the black and white and touch of colour. thanks for playing along with Clear it Out for the Easter challenge with a twist. Wow I would never think to use black and white on an Easter card but this looks great. Thanks for joining us at Going Grey with Scrap-Creations.